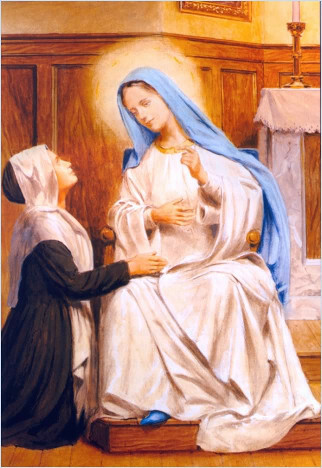 Saint Catherine was born on May 2, 1806, and at an early age entered the Community of the Daughters of Charity in Paris, France. When she was a 24 year old Novice, Our Lady appeared to her on several occasions at the Community Motherhouse in Rue de Bac in Paris. The first apparition was on July 18, 1830. She was sleeping in her bed in the dormitory with the other Novices, when her Guardian Angel appeared to her, appearing as a child about 5 years of age, in dazzlingly bright clothes. The angel said, "Come to the Chapel, the Blessed Virgin is waiting for you. She was led towards the Sanctuary, and knelt by the Director's chair. Suddenly she saw a most beautiful Lady walking towards her. The Lady sat on the Director's chair next to Catherine. The angel told Catherine, "This is the Blessed Virgin". The Lady spoke, telling Catherine that she was to be entrusted with a certain mission, and that it would be difficult and she would suffer many trials in carrying it out. She told Catherine that her mission would be revealed to her at a later time. Our Lady told her that great troubles would descend on France, among which would be the killing of the Archbishop of Paris, and the whole world would be in sadness. Some of these troubles would happen soon, and some in about 40 years time. Just nine days later, on July 27,1830, a revolution broke out in Paris. The King, Charles X, was dethroned. Churches were desecrated, statues destroyed and crucifixes thrown down and trampled upon, priests and Bishops were imprisoned, tortured and killed. In another revolution in 1848, King Louis Philippe was dethroned, and Archbishop Affre of Paris was shot as he pleaded with the mob for peace. Then in September of 1870, Emperor Louis Napoleon III was dethroned, through the Franco-Prussian war. Six months later a disastrous revolution lasting only two months broke out in Paris. Churches were desecrated, sacred things publicly profaned and finally thirty priests including Archbishop Darboy were put to death. On July 27, 1830, Our Lady told Sister Catherine what her mission in life was to be. 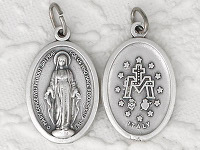 It was to have made and distributed the Medal of the Immaculate Conception, more widely known as the Miraculous Medal. The sisters were gathered in prayer in the chapel, when suddenly Our Lady appeared to Sister Catherine. She appeared wearing a white dress, a blue mantle, and a white veil draped over her shoulders. She was standing on a globe, and had one foot firmly planted on a serpent, which lay at her feet. The year "1830" was marked on the globe. She had her arms and hands pointed down, and from the many sparkling gem-encrusted rings on her fingers, bright rays of lights extended downwards. An oval frame appeared around her with the beautiful words, "O Mary conceived without sin, pray for us who have recourse to thee", written in gold letters around and within the frame, in French. Then the Vision turned around so that Catherine could see the reverse side. She saw a Cross with a bar at its feet, intertwined with the letter "M". Beneath the "M" were the two hearts, one pierced with a sword, and one surrounded by a crown of thorns, and both surmounted by flames of love. Around the frame of the oval she saw twelve stars. This could be a reference to the Great Sign mentioned in the Book of Revelations (Apocalypse) - "A woman clothed with the Sun, with the moon beneath her feet. and on her head a crown of twelve stars." Catherine heard Our Lady say, "Have a medal struck after this model. All who wear it will receive great graces." During 1830 and 1831 the vision was repeated six times, to give Catherine the courage to carry out this mission. She had to suffer much for this, firstly to get the medals made, and secondly to keep herself hidden. Catherine spoke to no one about these visions except her Spiritual Director Father John Marie Aladel. After almost two years of discernment Father Aladel visited Archbishop Hyacinth de Quelen of Paris in January 1832. The Archbishop listened to him carefully, questioned him competently and finally gave permission for the medal to be struck. Sister Catherine died on December 31, 1876. In 1895 her cause for Beatification was introduced in Rome. She was Beatified on May 28,1933, and canonised a Saint on July 27, 1947. 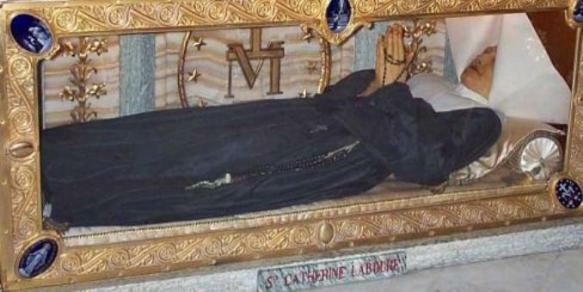 When her body was exhumed, fifty-seven years after her death and burial, it was found to be incorrupt and supple. Her incorrupt body now lies in a glass coffin in Rue de Bac, Paris, for all to see.